I admit to having something of a love / hate relationship with beads. Love what they do but strongly dislike sewing them on. Would you like to see more of these projects ? ?? The shoes are for ME the other items are for Blythes - yes those dolls are taking over this blog. 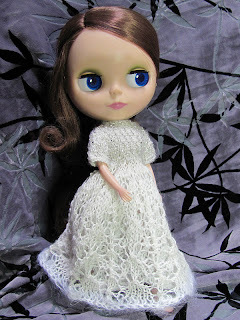 Over the Christmas / New Year season I organised another swap for the Knitting for Blythe group on Ravelry. 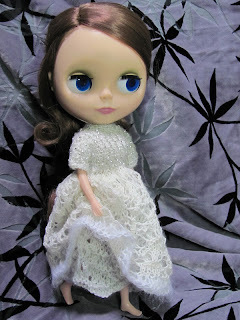 My swap recipient (the person whose dolls I was making for) lives in rural France, in Bourgogne which is one of my favourite parts of the world sigh! 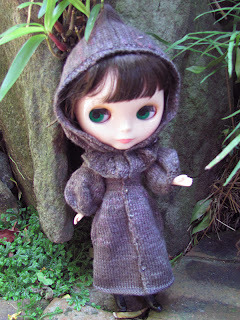 She customises most of her dolls - making them look quite elfin and other-worldly ... so I simply HAD to make fairy / pixie / elfin outfits. The first evolved into a SnowDrop Fairy costume - SnowDrop because that's the name of the lace stitch that I used for the top skirt. There is a built in 'petticoat' layer too. Two lace-weight yarns with white mohair yarn at the hem; one lace weight I dyed a very pale blue/grey - using 2 shades of white together creates depth. Both lace-weights held together for the bodice with mirrored glass seed beads knitted in. 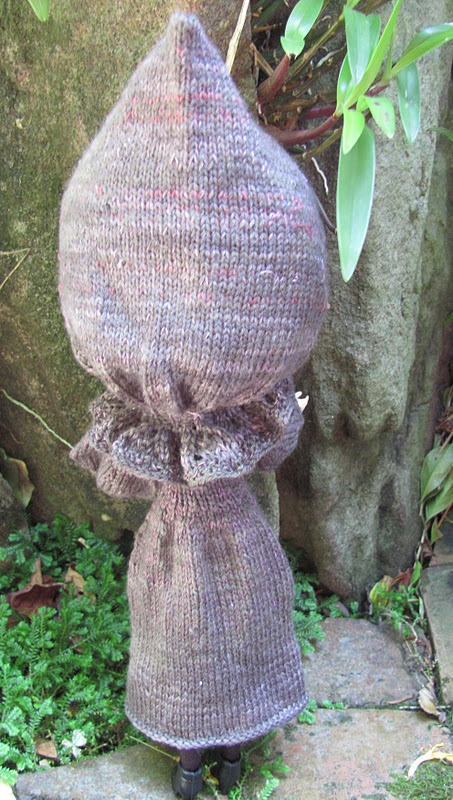 My first ever attempt at knitting with beads. 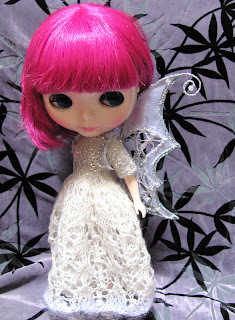 OK - pretty dress but this is a Fairy Costume and you simply cannot have a Fairy Costume without Fairy Wings! 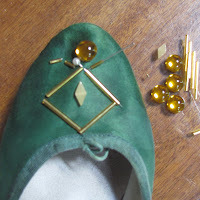 Complex wee things to make - but rather fun too. 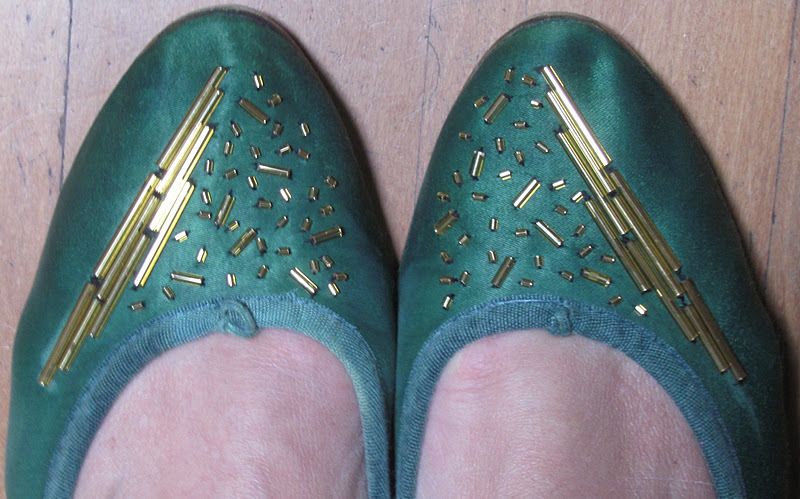 Remind me to do a 'workshop' blog to show you how I made them. 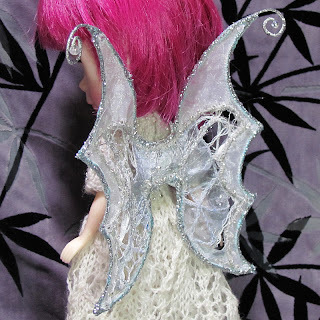 Violetta modeled the wings for me. The 2nd swap outfit evolved from memories of the forest in Bourgogne in winter 2007 (our 2nd ever overseas holiday). Artists and photographers talk about 'the quality of light' - the sunlight. In France the sunlight has a softness, a hazyness - you can see why it was the birthplace of Impressionism and Pointillism! The colours of the forest( forêt) in early December, late afternoon - all chestnut and antique mauve - the light definitely had a purple tint. 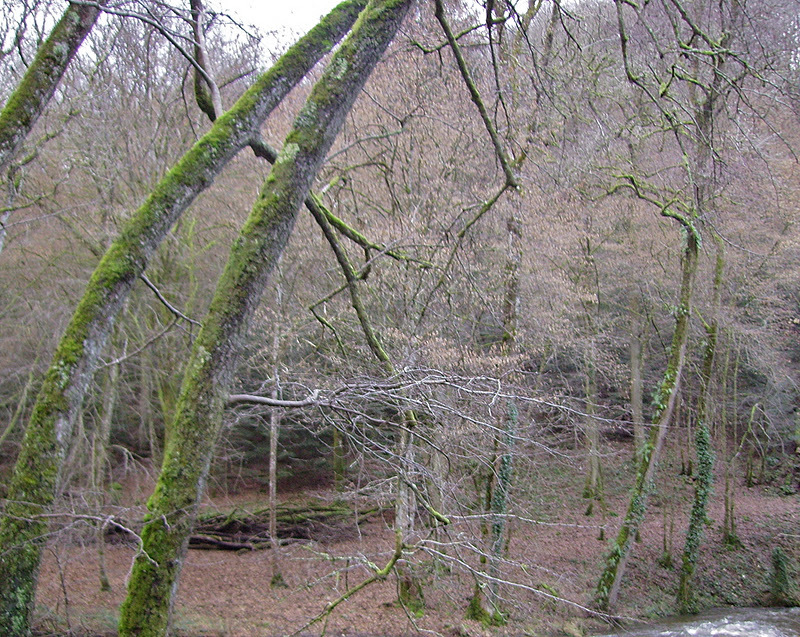 This is an outlying bit of the Forêt de Champornot with the river Cure in the foreground. I tried to reproduce those colours in a dolly outfit. Again in lace-weight yarn - this time Touch Yarns hand-dyed in lovely soft browns and greys to which I added strands of embroidery thread in antique mauves. Not quite right but getting there. A fitted coat with big 'romantic' sleeves, buttoning down the front with crystal glass beads. Also made a hood, it is not snug about the face though it isn't quite as flatteringly / romantically loose as I planned. Still it is cute with the frilly cape collar and pixie point. I like the thought that although I cannot go and live in rural Bourgogne (Burgundy) at least some things that I've made can be there in my stead. 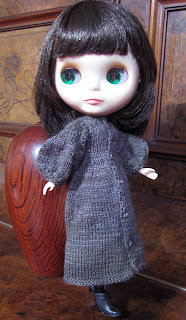 The last of the Blythe garments I'm going to show off today is a prototype. 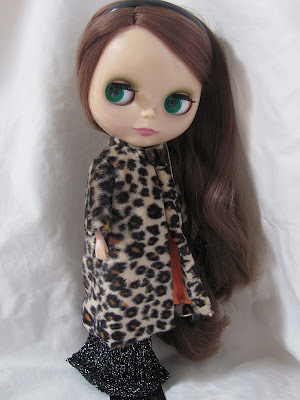 Found this faux fur fabric last week - perfect for doll's clothes as the print is tiny and the fur is low pile (short - like a velvet). As I mentioned in the last post, I'm toying with the idea of opening another Etsy shop - one with clothes & costumes for Blythe dolls. Hence this prototype coat - the pattern needs some refinement but the idea - Glamour, Mod, MadMen Era - I think it works. The beads - 2 real tiger-eye beads (nothing but the best for my Blythes!) 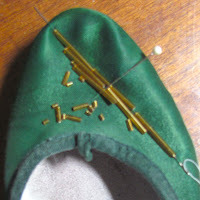 with a thread loop for fastening under the chin. 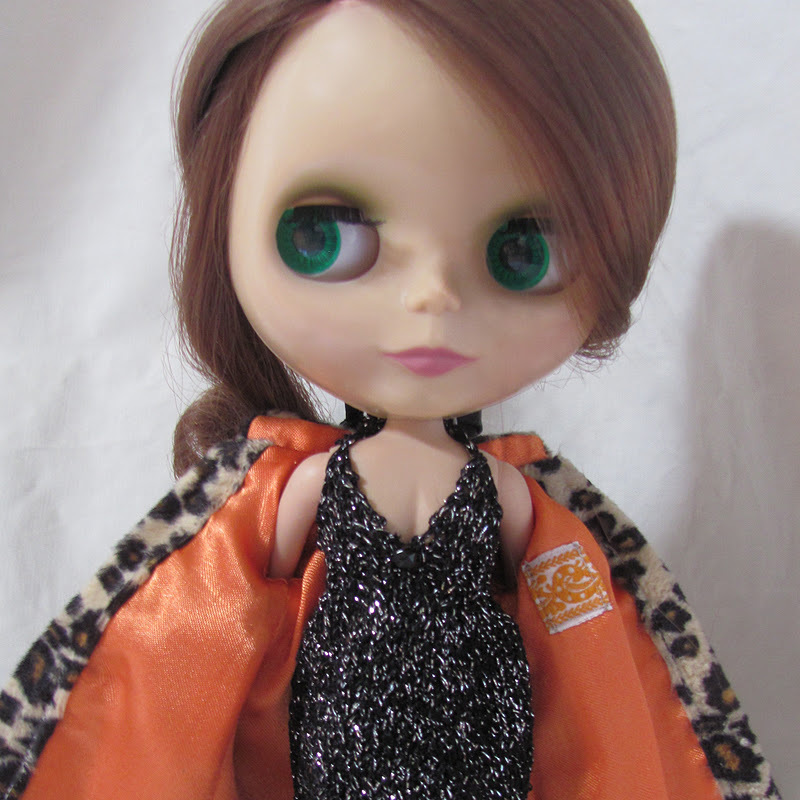 I gave the coat orange satin lining - the alternatives, beige or black seemed just too boring. Also included a special little inside pocket. 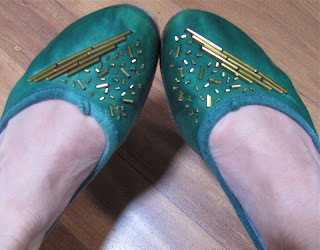 Disco? Super Hero crossed with a Cup-Cake ??? I don't know really but I like it! 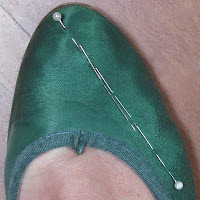 From past experience I know that shoes look slightly different when your foot is inside them - so I marked out that dramatic diagonal line with pins and inserted foot with care!